The word makes me cringe. I can't stand messes. I especially have a hard time with messes that are my own. It's hard to see the beauty of something when the mess is what stands out to me. Take this picture of our kitchen counter (which I took this morning). The main thing I see when I look at it is how cluttered and disheveled it looks. But upon closer reflection, I see more than that. I see an orange mug that's filled with coffee for Anthony to take to work. I see a sweet book from the library, Betsy-Tacy. Lots of groceries. A little square box my grandparents had for me to use as a bank when I was little. A juicer. And the thing that stands out most, flowers Anthony recently bought me on our trip to Trader Joe's. Each of these things represents other things like: a job, the ability to read, money for groceries, memories from my grandparents, the ability to make healthy food, and the love of my husband. I can look at this counter and be frustrated by its imperfection or I can look a little deeper and see the other things that it stands for. Maybe that's what I'm learning right now, how to see the beauty of messes. And this includes my own self. 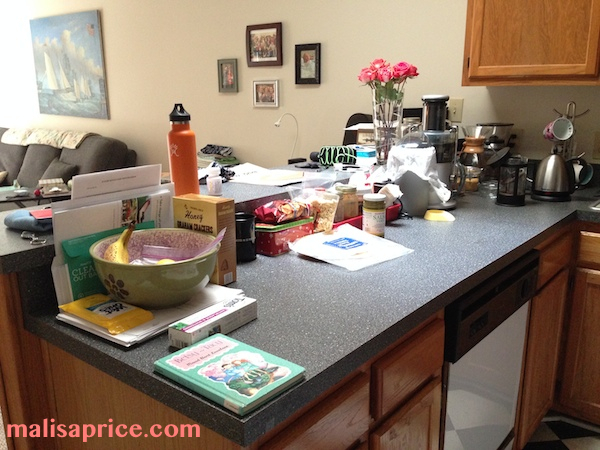 Linking up with Lisa-Jo for Five Minute Friday where we write freely for 5 minutes.